Right now this Hoover REACT Powered Reach Premier Bagless Upright Vacuum is down to $155.99 (Retail $349.99). -FloorSense Technology - Utilizes micro-sensors that detect changing floor types and automatically adjusts brush roll speed for the best results on any floor type. -Powered Lift System - Powered Reach Mode gives you greater access and further cleaning reach without having to move furniture. -WindTunnel Surge - Designed to capture dirt, dust and pet hair. -Multi-Cyclonic Technology - Our advanced technology for No Loss of Suction ensures a continuous cleaning experience. 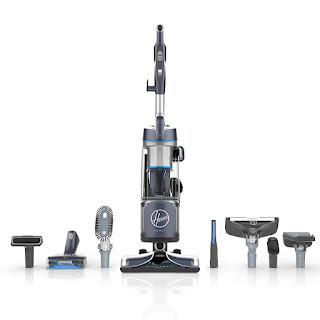 -Hoover App - Hoover REACT Powered Reach is compatible with the Hoover App, which allows you to customize your cleaning experience and maintain your vacuum for optimal performance.